September 23, 2015 ~ Craig M.
Resounder is a bustling trio improv session with electronic enhancements added by saxophonist Aram Shelton after-the-fact. But the effect can be subtle. In fact, the players are so adept at wringing sounds from their instruments that you have to wonder if some of the exotic sounds are coming from the original session. 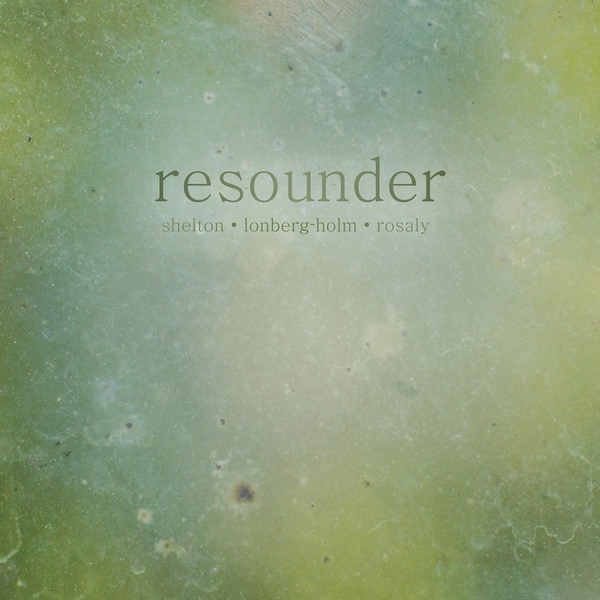 I say that because I first listened to Resounder blind, not knowing about Shelton’s post-processing. Once I knew it was there, my ears started playing tricks on me, particularly on “Bring Focus.” That buzzing tinge in the sax — is it acoustic or electronic? Did the sax just echo a few notes artificially, or was that my imagination? Now there, that was definitely a sax looped back into the mix … you get the idea. “Fading Memory,” with Fred Lonberg-Holm‘s cello altered to spit ribbons of metal — that’s a more obvious example. Drummer Frank Rosaly gets his turns too, I think. One segment (which I now can’t find) has his toms and bass drum melted together into a low-flying tonal hum. Or was that just my imagination again? Some of the electronics are more overt, which is good fun. Longberg-Holm gets plenty of electronics treatment to create dull roars and guitar-hero antics. There’s a passage later on “Bring Focus” that’s a long ramp to a crescendo, a nice slow burn of rumbling with a buzzy edge to the cello. And when it’s done, the band drops out, leaving behind a tinny sine wave — it’s a good dramatic moment. Shelton had planned this to be a regular trio recording, just three good friends getting together in Chicago, and they turned in a crackling set. It’s only afterward that Shelton started considering enhancing the sounds, and it adds depth to what was already a densely packed session. Sometimes there’s some playback that literally adds another voice to the group. More often, though, it just sounds like more than three people, as Shelton’s processing creates new surfaces for the ear to cling to.